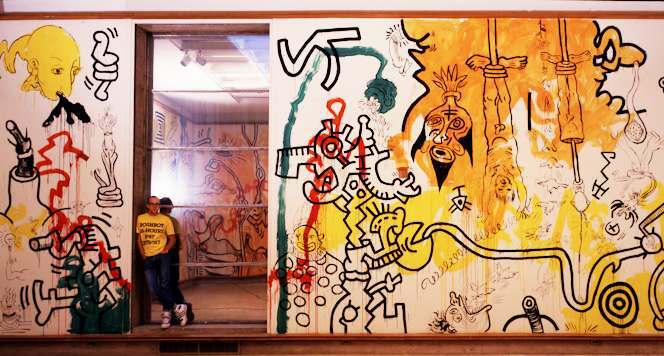 Keith Haring: The End of the Line will open at Cranbrook Art Museum 30 years after the artist created his landmark temporary mural at the museum in 1987. He considered that project one of his best, and it marked a new direction in his visual language that continued until his untimely death in 1990 at the age of 31. Documentation of this pivotal project will be presented alongside two bodies of work anticipated by the mural and made in collaboration with acclaimed beat poet William S. Burroughs—Apocalypse (1988) and The Valley (1989). Haring became a widely-celebrated artist for his comic-like drawings and paintings in the New York subways in the 1980s. At his lecture at Cranbrook on September 25, 1987, Haring discussed his intentions in these early subway explorations: “I started making drawings that were figurative after doing abstract work for almost five years, and for the first time, it seemed like I had made something that made sense to be in public because it had a kind of communicative power. [It] seemed like they should be in places where people could see them and think about them.” Haring’s Subway Drawings were ephemeral works that were documented by his friend and fellow artist Tseng Kwong Chi. A selection of these photographs along with a rare, surviving example of one Haring’s large-scale subway drawings, still intact on its advertising panel, will be on view. The End of The Line concentrates on the last years of Haring’s life, when his work and activism got intensely personal after being diagnosed with AIDS. The Cranbrook mural introduced stylistic shifts of intentional drips and blotches, but it also depicted characters he continued to explore in Apocalypse and The Valley, such as jesters, masks, skulls, martyrs, and other religious icons. Entrenched in thoughts and philosophies about the end of times, Haring’s later works have art historical kinship with the chaotic storytelling of Hieronymus Bosch and violent playfulness of his friend and contemporary Jean-Michael Basquiat. The ominous texts by Burroughs stationed alongside them complement the energy of Haring’s drawings, which have the frenzy of an artist trying to process life before its end. Keith Haring: The End of the Line is organized by Cranbrook Art Museum with the assistance of the Keith Haring Foundation, whose mission is to sustain, expand, and protect the artist’s legacy art, and ideals. The Foundation supports not-for-profit organizations that assist children, as well as organizations involved in education, research and care related to AIDS. Additional assistance provided by Muna Tseng and the Estate of Tseng Kwong Chi.Keith Haring: The End of the Line is presented at Cranbrook Art Museum contemporaneously alongside three other solo exhibitions by artists that all operate at the intersection of art and street culture: Ryan McGinness: Studio Views; Basquiat Before Basquiat: East 12th Street, 1979-1980 (traveling from MCA Denver); and Maya Stovall: Liquor Store Theatre Performance Films.